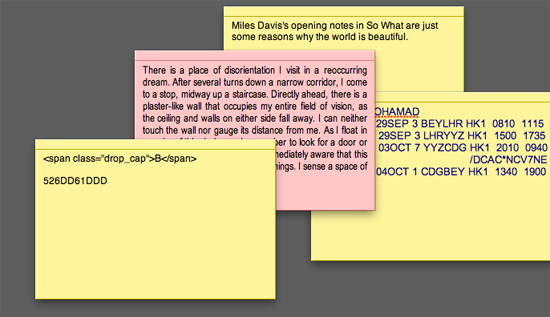 This sticky note sat forgotten on my desktop for eight days. While having a one-sided argument with my mother (she talked as I listened and nodded) this afternoon about my lousy financial management, I came across this sticky note. Sitting forgotten on my desktop, it is tagged Monday September 20, 2010, 3:05:02 PM Lebanon Time, but I don’t remember writing it. There is a place of disorientation I visit in a reoccurring dream. After several turns down a narrow corridor, I come to a stop, midway up a staircase. Directly ahead, there is a plaster-like wall that occupies my entire field of vision, as the ceiling and walls on either side fall away. I can neither touch the wall nor gauge its distance from me. As I float in a realm of thin darkness, I remember to look for a door or window in the half-light, but am immediately aware that this place has nothing to do with such things. I sense a space of infinite depth all around me.